Start your day off right with our Hash Brown Breakfast Casserole! 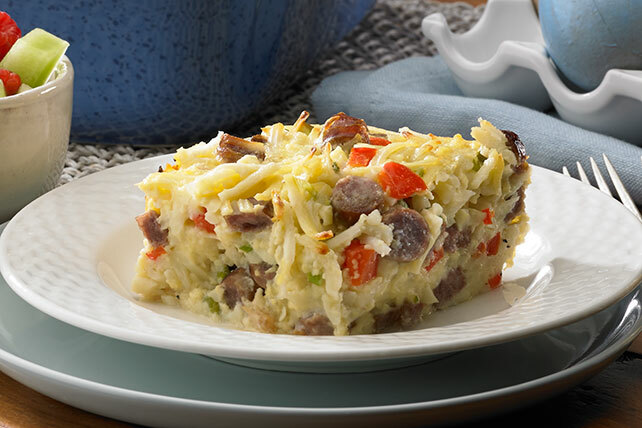 Sausage eggs, hash browns and cheese all come together for our tasty Hash Brown Breakfast Casserole. Cook sausage as directed on package; drain. Cut into 1/4-inch-thick slices. Whisk eggs, milk, mustard and black pepper in large bowl until blended. Add potatoes, cheese, red peppers, onions and sausage; mix well. Pour into 13x9-inch baking dish sprayed with cooking spray. Refrigerate overnight. Remove casserole from refrigerator 30 min. before baking. Heat oven to 350ºF. Bake casserole 1 hour 5 min. to 1 hour 10 min. or until center is set and top is golden brown. Remove from oven. Let stand 10 min. before serving. Wake up to the irresistible aroma of this satisfying morning casserole that's fit for a special occasion. Serve topped with TACO BELL® Thick 'N Chunky Salsa, and BREAKSTONE'S or KNUDSEN Sour Cream.